1857 2d Blue, SG 35, Plate 5, Large Crown P14, lettered B-D. Very fine CDS used. 1855 2d Blue, SG 23, Small Crown P14, Plate 4, lettered B-F. Very Fine Used. 1841 1d Deep Red-Brown, SG 10, PLATE 11, Lettered P-D. A VERY FINE USED FOUR-MARGIN EXAMPLE. 1841 1d Red-Brown, SG 8, Plate 28, cancelled by a distinctive NORWICH Maltese Cross - a fine four-margin example. Cat £550. 1876 2½d ROSY MAUVE, SG 139, PLATE 3 and 2d BLUE, SG 47, PLATE 14, TIED TO TOO LATE (LATE FEE) COVER FROM LONDON TO NEW YORK SHOWING A VERY FINE BOXED 'L2' IN RED. 1853 TREASURY ROULETTE 1d RED-BROWN, PLATE 158, N-I, SPEC B2a, tied to miniature envelope to Sutton Coldfield from London - RPS CERTIFICATE STATES "Stamp removed and reaffixed IS GENUINE". CAT £23,000. 1841 1d Red-Brown, SG 8o, Plate 15, lettered A-B. A four-margin example CANCELLED BY A SUPERB, ABBREVIATED, 'NORTHLD. (NORTHUMBERLAND) UNDATED CIRCLE. Unlisted by Danzig. 1843 1d Red-Brown, SG 8, Plate 31, lettered L-L. A superb used right-hand marginal example. 1841 1d Red-Brown, SG 8o, lettered L-C. A four-margin copy cancelled by a FAREHAM circular town datestamp. Very Rare. 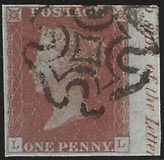 1857 1d Rose-Red, SG 40, lettered R-I. SUPERB LATE USE WITH MALTESE CROSS CANCELLATION. CAT £650. 1870 ½d Rose-Red, SG 48, PLATE 9, lettered T-M. A very fine mounted mint example. Cat £4000. 1845 1d Red-Brown, SG 8o, Pl 55, lettered A-G/A-H, Pair cancelled by LEICESTER CIRCULAR TOWN DATESTAMPS. Very Scarce. Cat £1600. 1841 1d Red-Brown, SG 8, Plate 18, lettered R-I, cancelled by a SUPERB WOTTON-UNDER-EDGE MALTESE CROSS. Cat £6000. 1855 1d Red-Brown, SG 22, Small Crown, P 14, Plate 9, lettered L-J - VERY FINE USED WITH CRIMEA 'O*O CANCELLATION. 1843 Entire to Peterborough franked by four 1d Red-Brown, SG 8m, and tied by FOUR FINE STRIKES OF THE No 12 IN MALTESE CROSS which is a RARE usage on cover - singles are Cat £1100 on cover. All stamps are affected by vertical filing creasing. 1855 2d Blue, SG 19, Plate 4, Q-L, tied to envelope addressed to London by a very fine Type VII DUKE STREET Scottish Local cancellation. 1841 1d RED-BROWN, SG 8, PLATE 13, K-G. A very fine four-margin example tied to entire to Cardiff tied by a COWBRIDGE Maltese Cross and with a fine Lantwitt/PennyPost alongside, W 1253. Cat £280 on cover. 1843 1d Red-Brown, SG 8m. A very fine four-margin example tied to entire to Peterborough by a very fine No 10 IN MALTESE CROSS. 1853 1d RED-BROWN, SG 8, PLATE 154?, LETTERED T-E, ALPH II. A SUPERB LARGE FOUR-MARGIN EXAMPLE SHOWING PART MARGINAL INSCRIPTION BELOW - "...LABELS ABOVE THE..." tied to neat envelope to London by a very fine BARNSTAPLE '150' NUMERAL CANCELLATION. VERY ATTRACTIVE. 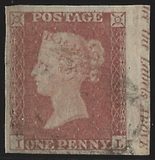 1841 1d Red-Brown, SG 7, PLATE 5, J-B. A superb four-margin example tied to entire to Dewsbury by a very fine strike of the DISTINCTIVE LEEDS SPECIAL MALTESE CROSS, Spec A2ua. Cat £3000. 1863 LATE USE 1d RED-BROWN, SG 8, N-G. A four-margin example tied to envelope to Liverpool by the STAFFORD ERROR 780 NUMERAL for 730, together with two other items with the correct "730" numeral. 1841 1d Red-Brown, SG 7, PLATE 10, lettered O-K - and it is! A very fine four-margin example. 1841 1d Red-Brown, SG 7, Plate 2, lettered A-I. A very fine used four-margin example. 1841 1d Red-Brown, SG 7, Plate 2, lettered H-E. A very fine used four-margin example. 1841 1d Red-Brown, SG 8m, lettered Q-C. A fine used four-margin example with No 8 in Maltese Cross. 1841 1d Red-Brown, SG 7, Spec AS6, PLATE 1B, lettered C-C. A very fine used 4-margin example. 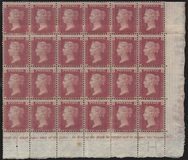 1857 1d Rose-Red, SG 40, PLATE 45, L-A, SPEC C10, tied to piece by a Superb Type II Exeter Sideways duplex. VERY SCARCE PLATE. Cat £400. 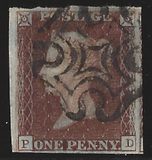 1857 1d Orange-Brown, SG C9 and 1d Rose-Red, SG C10. A VERY FINE USED MATCHED PAIR, PLATE 27, A-D, RE-ENTRY. 1850 ARCHER 1d RED-BROWN, SG 16b, Plate 99, lettered N-B. A very fine used example but with light crease. Cat £650. 1858 1d Rose-Red, SG 40, D-K/F-L. A fine used Block of 6 with Irish-type Belfast Spoon cancellations.